Dozens of legendary football players have shown off their skills in FIFA’s promo clip to mark 100 days until the Russia 2018 World Cup – and the Russian president proved he was facing the countdown head-on. The array of famous football stars was joined by two men who have never played professionally, but have a big stake in the upcoming championship: FIFA President Gianni Infantino and Russian President Vladimir Putin, who passed the ball to each other in a hall of the Kremlin. 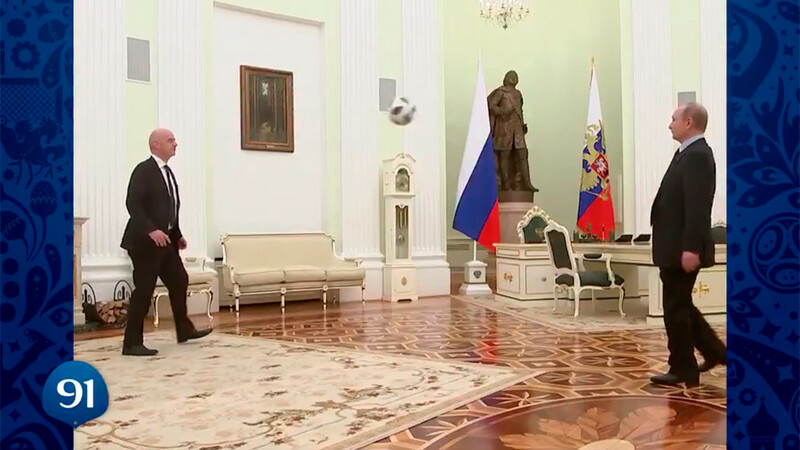 Putin delivers the last contribution to the marathon juggling show, heading the ball back to the FIFA chief to make 100 touches. The majority of the players who featured in the clip are retired, but they would have made a hell of a team in their prime. Stars showcasing their keepie-uppie capabilities include Peter Schmeichel, Diego Maradona and Wayne Rooney. — FIFA World Cup 🏆 (@FIFAWorldCup) 6 марта 2018 г. The 2018 FIFA World Cup Russia will begin on June 14 and continue until July 15. Russia has prepared 12 arenas in 11 cities to host the games.